Sounders FC hosts the Colorado Rapids in regular-season action. 33’ - DANG NABBIT! Clint with the little dink over the top to Oba who is on goal but can’t settle it down and blasts over wide. S'ok. 34’ - NEARLY TWO! Tyrone into Dempsey who just rounds Irwin but can’t get the ball over the line. WE WANT A SECOND. 36’ - Sounders just ALL OVER Colorado right now. FKs, balls into the box, shots. Clint just fires one over. 37’ - And he’s up. Goal! Penalty! #LAvRSL and #PORvDC off to great starts. 38’ - The flicks and tricks on display tonight are next level. 41’ - Marco just drags a dude down after he gets tackled. Advantage played. This match is fun. 43’ - Rapids break forward but Zach busts a gut to get back and then the Rapids turn it over for a GK. Take that one. 43’ - Deeeeep shot comes in there from Doyle that Frei fumbles a bit but takes. That guy can shoot! 44’ - Oba with a little DIPSY DO on Watts after the entry ball is taken well. Not a bad foul, not a bad foul. 45+ - We will have one minute of stoppage time here. That is one minute. One minute. ONE. MINUTE. O. N. E.
HT - Your thoughts on the first half of #soccer action here at CenturyLink Field? HT - Dat poss % tho………..
HT - This is @shanevans with you here at @CenturyLink_Fld . My stats compliments of Opta and someone who can count good. 46’ - WE ARE BACK, Y’ALL! 46’ - Change for Rapids. Juan Ramirez. Torres off. ALRIGHT! 48’ - Foul by Rose there in a good spot for Colorado. FK coming from about 22 yards out. 49’ - I looked away to eat some candy but I think it hit off the wall. TV says…yep. Well done, wall. 50’ - Roldan FLASHES the cross through the area and eludes everyone. SO close to Rose there for a tap in. Great ball. 51’ - MARCO SO CLOSE AGAIN! Lines it up with the left and rips it just over the bar. That would have made the score 2-0! 53’ - FK comes in from Colorado and is headed out for a corner by B-rad. 53’ - Corner comes in and sent out. 54’ - According to my main homie @WillParchman …Sounders 426 passes the most in a first half of @MLS #soccer in FIVE YEARS. 55’ - While I was trying to remember that number, Ozzie gets a yellow for a foul on Solignac. 56’ - FK taken low and hard by Burch but again into the wall. Rapids much better so far in this half. Ramirez with the low cross to no one. 57’ - Great recovery there by Brad who gets back to deny a clear chance for Ramirez and blocks the shot out for a corner. 58’ - Corner in and out for a GK. 61’ - Dempsey fouled after getting banged around in the middle of the pitch. All kinds of interesting fouls being called tonight. One sec, they're all busy right now ???? 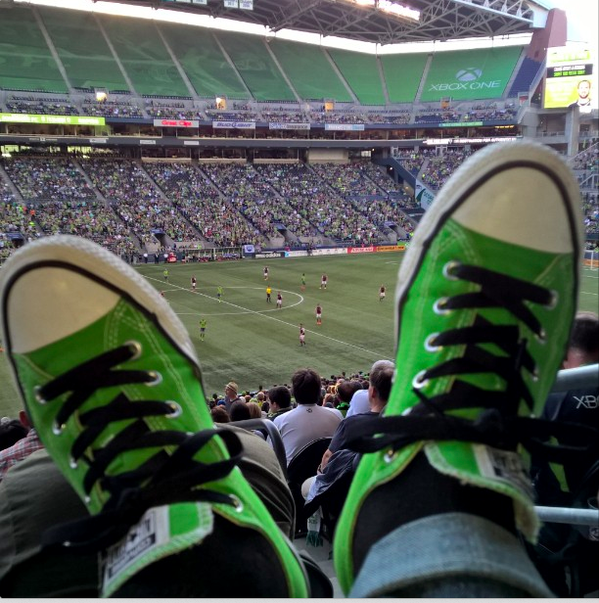 #SEAvCOL RT @danielnyari : Which one of you guys is a die-hard @SoundersFC fan? Need a quick word! 61’ - Deeeeeeeeeep FK chance here for the Sounders. Looks to be about 36.4 yards out. 61’ - Sent in by the Deuceman but right at Irwin. 62’ - Brad and Solignac with a clash of heads. Those are never fun. Your head is important. It is where your brain lives.